Anyone who knows me knows that my love for cheese is strong. So when I had some blue cheese in the fridge and a desire for a savoury breakfast, I investigated what I could incorporate my blue cheese into. Now, pear and blue cheese is a classic pair (pardon the pun! 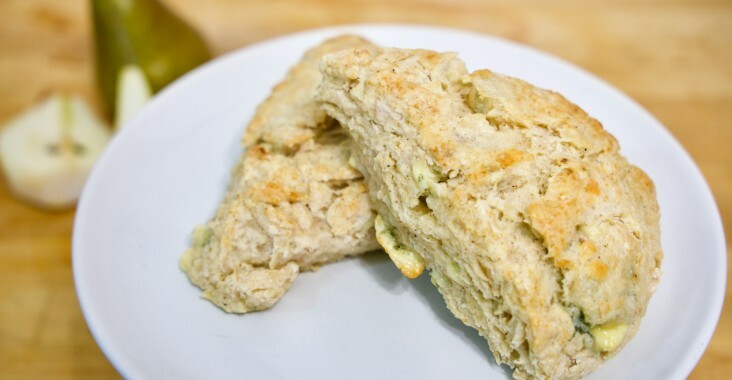 ), but I had never seen the combination in a scone before. Worth a try! Preheat oven to 400 F. Line a baking sheet with parchment paper. In a large bowl, mix together dry ingredients. Using a pastry blender, cut in butter until butter pieces are small crumbs. Gently fold in the blue cheese and pears. Add vanilla extract to the buttermilk before slowly pouring onto dough. Stir gently until dough just comes together. Do not overwork the dough as this will yield tough scones. Turn out dough onto lightly floured surface or silicone mat and gently knead the dough a few times. Shape and flatten into a round disk, about an 1″ thick. Cut into 8 triangles and arrange on prepared baking sheet. Brush the tops with cream. Bake for 13-15 minutes or until golden brown on top. Transfer to a wire rack to cool completely. These were deliciously delightful! Fluffy and light–the blue cheese and pear flavours came through perfectly. I drizzled just a touch of honey on top for a bit of added sweetness. They’re burly-sized scones, so one is definitely enough, leaving plenty for leftovers. They do well re-heated in the oven for 10 minutes at 250 F (reheating in the oven is preferred to the microwave so that it doesn’t become soggy).